With a series of major international events culminating in the summer Olympics in 2016, Rio de Janeiro is set to make its comeback on the international scene after decades marked by violence and neglect. A crucial step on the way to regaining the trust of investors and tourists is lowering the city's infamous crime rate, mostly concentrated in the gang-controlled favelas. 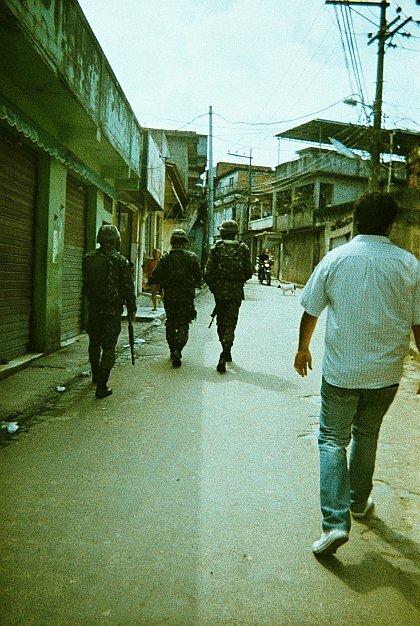 To do so, the state of Rio de Janeiro has engaged in an ambitious favela-clearing program called “pacification” or UPP (for Pacification Police Units), which involves retaking territories through invasions led either by SWAT-like units or the military itself, and subsequently handing daily policing to community police forces while bringing much-needed public services to the area. Complexo do Alemão during the military occupation. Flavie Halais. Over 30 communities have already been “pacified”, with 70 more to come by the 2016 deadline. For Cariocas, as Rio residents are known, the pacification comes as a breath of fresh air in the midst of daily violence, their response to the program has been overwhelmingly positive. Meanwhile, the world observes with interest, as the programme holds the potential to provide a solution for countless other urban areas plagued with violence. The question on everyone's lips is: will the pacification be successful? And will its success be sustainable over the long term? Yet a far more crucial question remains unasked: how does a democratic country on the path to economic prosperity come to view warfare as the preferable solution to dealing with a matter of national policing? The answer, while complex, provides an insightful glimpse into the practice of urban governance in today's militarized cities. Security in Rio has been a concern of international observers since the city won the bid to host the Olympics in 2009. Indeed a 2009 cable from the U.S. embassy in Brasilia and released by Wikileaks read: “the great question mark concerning Rio's selection has been the security situation, a question brought to the fore on October 17th as a gunfight between drug gangs resulted in the shooting down of a police helicopter”. The drug factions that took control in the 1980s rule over most of Rio's 600 favelas with extreme violence and their wider grip over the city at large should not be understated. In 2002, the Red Command, Rio's oldest faction and one of its largest, ordered all stores and schools to close for a day in protest against the detention of the faction’s leader. Residents dutifully complied, fearing retaliation. In a way, Rio de Janeiro is but another name on the list of urban areas perceived as problematic. In recent years, urban conflicts in vulnerable cities such as Bagdad, Kabul, Medellín or Ciudad Juarez have led academics in the military, geography and planning circles to view cities of the developing world, with large numbers living in informality and governed by weak governments, as a breeding ground for terrorism and widespread violence. A vocabulary of “urban battlespace”, “feral”, “failed” or “fragile” cities are just some examples of the language used in academia to describe cities in conflict. In many ways, both the academy and policymakers’ preoccupation with controlling the urban poor in such cities has eclipsed the will to understand reasons why violence exists in such cities, namely the failure of governments to include all populations into civic and economic life. The perceived danger posed by urban peripheries – although Rio's poor, due to particular historical reasons, remain in large part in the centre – has increased the divide between formal and informal city and provided governments the justification to instate drastic measures that often violate civil rights, from “slum” removals to security walls. Informal city dwellers, existing outside of regular judicial channels, find themselves living in a “state of exception” as theorized by Italian philosopher Georgio Agamben, wherein the state imposes exceptions to regular juridical order as permanent norms in chosen spaces. Interestingly, the same processes are understood to have taken place in many World Cup and Olympic cities, where regular laws are frequently suspended and civil rights ignored in the name of security. In places where mega-events and informal city collide, such as Johannesburg and Beijing, hundreds of thousands of residents have been affected by state violence. Increasingly, such logics are used to justify tactics of territorial governance usually confined to full-on wars, from surveillance to military invasion, a phenomenon well-documented by Stephen Graham in Cities Under Siege: The New Military Urbanism. Prior to Rio's pacification, Latin America had already been the terrain of several military operations intending to temporarily take over law enforcement duties and stabilize crime in places like Mexico's Ciudad Juarez and Tijuana, Colombia's Medellín, and Jamaica's Kingston. In 2007, Rio's state governor Sergio Cabral and secretary of public security José Mariano Beltrame travelled to Medellín and Bogotá to learn how both cities had managed to curb crime. Their UPP program was eventually inspired by Medellín's Orion operation, which successfully removed FARC guerrilla factions from the city, but in doing so led to major human rights violations and granted paramilitary leader Don Berna a monopoly on organized crime and violence in the city. Medellín's infrastructure upgrading and social programs, which were implemented after Orion, as well as Bogotá's social prevention and community policing programs, have been unanimously praised as being the source of a long-lasting reduction of crime. In Rio however, such social aspects of pacification have been relegated to a much less prominent place. "It is thus important not to be blinded by the achievements and uncritically present policies adopted in Colombia as a blanket model to be emulated in other parts of the world”, writes Vanda Felbab-Brown, an expert on international and internal conflict and counterinsurgency. “As with all public policies, molding anti-crime strategies to local institutional and cultural context continues to be a critical determinant of their effectiveness." Indeed, the history of Rio's favelas should not be so quickly assimilated to that of other “fragile cities”. Since the creation of Rio's first favela 115 years ago and until the 1990s when the first major infrastructure upgrading program was launched, the municipal and state governments have tolerated, but never incorporated favelas into the formal city, leaving residents to organize such services as electricity, running water or garbage collection in their neighbourhoods. After drug gangs moved in the 1980s, media reports continuously portrayed favelas exclusively as hotbeds for crime, leading to an increasing spatial segregation of social classes, despite less than one percent of favela residents engaging in violent crime. Such narrow-minded analysis omits the fact that favela residents are the maids, cooks, gardeners, nannies and other poorly-paid employees that have helped middle and upper classes maintain their lifestyle. It also conveniently forgets the role of Rio's notoriously violent and corrupt police force, whose history of brutality can be traced back to the military dictatorship, and who themselves are responsible for a large number of violent crimes, more than 1,000 homicides each year. That Rio de Janeiro would want to break with the status quo with an aggressive militarized campaign instead of the longer, but proven route of social programming cannot be merely explained by the need to secure the city for mega-events like the World Cup and Olympics. “Rio has safely staged major events and annually hosts 2 million people at the Carnival and New Years Eve celebrations”, notes a report by the International Olympic Committee. It might be worthwhile to note that crime had been declining in the city even prior to the UPP (from a homicide rate of 56.5 per 100,000 inhabitants in 2002 to 34 in 2008), and that an experiment in community policing was launched in 2002, and then discontinued in 2004. The creation of the UPP can perhaps be explained by Brazil's ambitions to become a major economic and military player on the Latin American and international stages, notably in the war on drugs (the country has launched a massive border securitization program, going so far as to conduct a coca eradication operation in Peru). Brazil's government has been lobbying for a permanent seat at the UN Security Council for years, and sought to prove its reliability by running the military wing of the UN peacekeeping mission in Haiti. In Port-au-Prince, the Brazilian army perfected its counterinsurgency and slum-securitization techniques, which army sources have since deployed in Rio's favelas – some soldiers who have been posted in both places have even reportedly found their work in Rio more difficult than in Haiti. But the UPP isn't just a political affair. The prospect of incorporating millions of residents into the formal economic life means big business for Rio and Brazil as a whole. “There are... significant economic interests at stake, with some analysts estimating Rio de Janeiro's economy would grow by 38 billion Brazilian Reals ($21 billion USD) should favelas be reincorporated into mainstream society and markets”, notes a 2009 cable from the US Consulate in Rio released by Wikileaks. The economic gains brought about by the pacification begins with residents starting to pay taxes, as well as utilities like electricity and cable TV (in gang-controlled favelas, utilities are stolen from the grid and sold for a profit by the gangs. Light, Rio's electricity company, was thought to lose the equivalent of 30% of the electricity it produces). Retail is also a major winner, with dozens of banks, telecommunication companies, clothing or furniture stores moving into pacified communities formerly out of reach, expecting to win dozens of thousands of new clients at a time. With such economic prospects, it is perhaps no surprise that the UPP program is subsidized by private companies like Coca-Cola, and by Brazil's richest man, entrepreneur Eike Batista. Rio's already inflated real estate market however, has gained the most from pacification, with house prices increasing by up to 50% in pacified communities only 24 hours after the “invasion”. In middle-class communities located near favelas, news reports cite increases of up to 600%. Vidigal, a small hillside favela conveniently facing the ocean, has been gentrifying at high speed, with foreigners and young Cariocas moving in as an attempt to escape Rio's unaffordable rent market. There is no doubt that other favelas in the touristy South Zone will follow suit. The pacification comes at a time of economic growth and social change in Brazil, with millions of Brazilians exiting poverty to access the “Class C”, the lower-middle-class. It can be safely said that some kind of change in the favelas would have taken place regardless of the pacification, with the historical equilibrium between the lower and middle/upper-classes disrupted by favela residents now accessing university education and higher-paying jobs. Although the pacification can certainly be recognized as the biggest effort ever conducted to tackle crime in Rio, it cannot be seen as the result of good timing as much as of good will, with social change, political forces and international events aligning to provide the perfect justification for an operation of that scale. The pacification is not the brainchild of a progressive government. It doesn't address profound issues such as corruption and real estate speculation, nor does it envision the much-needed reforms of the police or of the judicial system that should provide the stable bases for lasting change. It takes much more than a band-aid to fix a dysfunctional city.